Wireless charging is no longer a dream! Forget all your other chargers and the tangled wires and simply charge your mobile phone by placing it on a kitchen shelf. Qi Woodpad wooden charger in the LUBE kitchen is integrated with a shelf accessory under the wall unit, which becomes an elegant and functional part of the whole kitchen design. Use of Alpine wood from the Alto Adige region of Italy makes the mobile charger pad an absolute jewel. 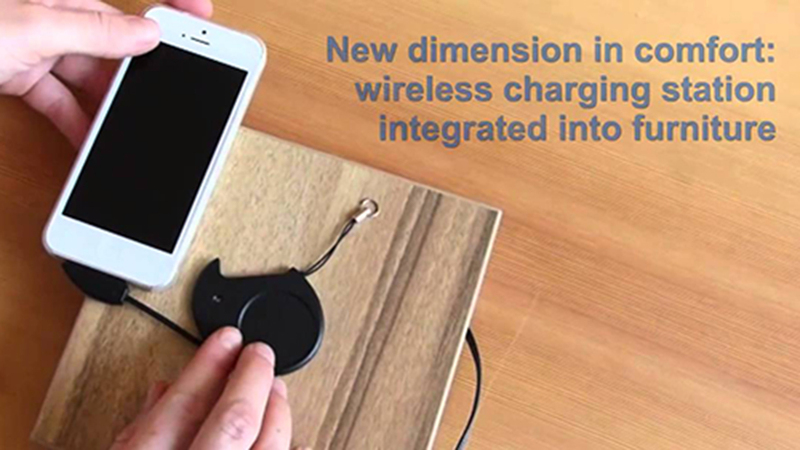 Qi technology is based on wireless induction charging with energy up to 5 watt Qi (a Chinese word meaning vital energy and pronounced “Tschi”). It is a new universal standard for wireless charging of battery-operated devices such as: mobile phones, iPods, MP3 players, video cameras and cameras. Qi can be used with all devices equipped with the integrated Qi standard for iPhone 3, 4, 4S, 5, 5C, 5S, 6, 6 plus with energy cards or covers widely available on the market, or with the Qi2001 receivers (key-rings) with iPhone 3-4-4S connector or Qi2001 with the iPhone 5, 5C, 5S – 6, 6 plus connector. The Qi2001 micro usb receiver is suitable for all devices which have this type of connector. With its 3 receivers, QInside covers 100% of the rechargeable devices currently on the market. 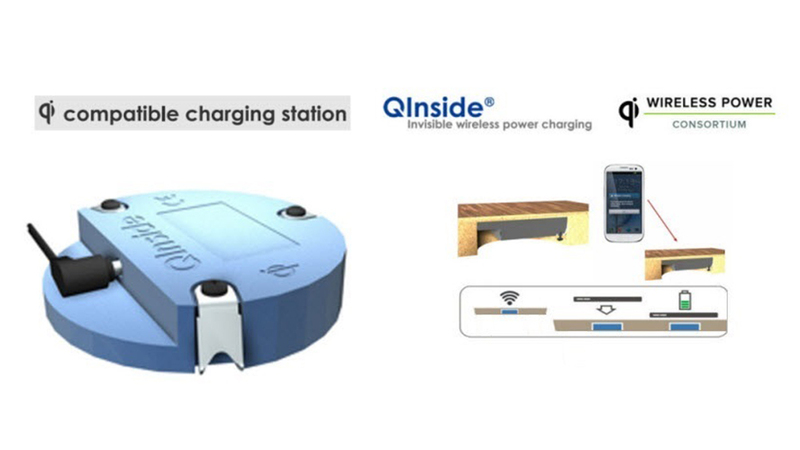 The Qi wireless charging technology is compatible with mobile phones and battery chargers of different manufacturers. The only requirement is that both the sender and receiver satisfy Qi specifications. A large number of phones already satisfy the Qi standard and can be charged with any Qi-compatible charging station, including market leaders such as Nokia, Nexus, Samsung, Sony, LG, Motorola, HTC, etc. And the list keeps growing. Qi is being used by an increasing number of electronic device manufacturers; therefore you can use just a single battery charger for all battery-operated devices. 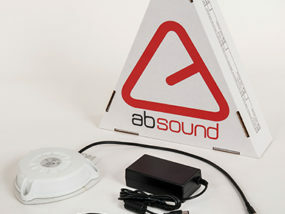 Produce sound without adding any visible devices to the surrounding environment with ABSOUND! It is a Bluetooth speaker, which produces sound on entire rigid surfaces of various materials, making them vibrate and basically turning them into excellent acoustic propagators. A genuine revolution of the concept of sound emission into the environment, destined to change the way we enjoy sound and offering benefits in terms of the versatility of the solution, its invisibility, easy installation, standardization and the quality of the sound. It will be possible to “play sound” on false ceiling, walls, furniture, kitchen tops and tables, creating an enjoyable surround sound, irrespective of the position of the listener. ABSOUND is a solution with a stylishly linear look, as its replaces all the traditional speakers and, more importantly, uses a flat diaphragm principle, transforming the entire wall or ceiling as well as tables, desks and other items of furniture, or any surface on which it is placed, into a "loudspeaker cone". It is quick and easy to install, without the need for holes of any type. It is "eco-friendly" - it covers larger areas than traditional speakers, so less are necessary and electricity consumption is reduced.